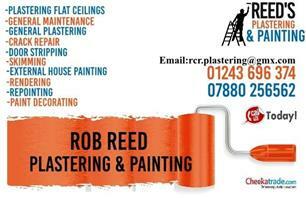 Reeds Plastering, Painting and Maintenance is based in Chichester and offers domestic, commercial and sub-contracting plastering, painting and maintenance work. I am proud to say, that I have over 18 years’ experience in the plastering, painting and decorating trade. I have also completed and passed a course with the Architectural Plastering College. I started Reeds Plastering & Painting Services as I wanted to ensure that all of my customers had the opportunity to work with a company, that put them first. We are a friendly, family run business and take great pride in our painting and decorating and have an eye for attention to detail. We can undertake all size jobs, both inside and out from a single ceiling or wall to a full room or house. Please feel free to call or email us and we will be more than happy to discuss your needs. We thoroughly enjoy our work and take great pride in all we do, striving for great customer satisfaction and exceptional customer care. We offer free quotations and advice and are fully insured. Chichester, West Sussex, Emsworth, Bognor, The Witterings, Fishbourne, Bosham, Selsey, Havant, Littlehampton, Worthing, Rustington.